When a service pack is released and there are many computers need to be updated. If it is Microsoft product, you can mange update through WSUS. But in my case, even I have WSUS server but the server only has Windows patches which replicates from primary WSUS that receives only Windows patches from Microsoft. To install Office service pack 3, I can release the patch file through Group Policy Object in logon script with silent installation so that user won’t be interrupted by the setup file. Download Office SP3 (Office2003SP3-KB923618-FullFile-ENU.exe) from Microsoft. Note: You can type “Office2003SP3-KB923618-FullFile-ENU.exe /?” to view command line options. Now you can see the extracted files on temp folder. MAINSP3.msp is the main Office service pack 3. OWC11SP3.msp and OWC102003SP3.msp are web components service pack 3 for Office XP and Office 2003 respestively. 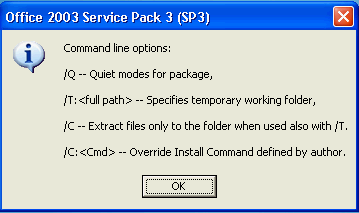 You can install Office Service Pack 3 by execute one of these commands below. Install with NO user interface. When it finishes install the service pack 3, the computer will be force to restart automatically. 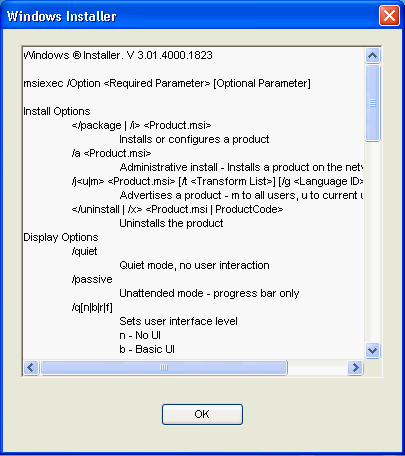 Install with NO user interface and force not to restart after finish install the service pack 3. Note: If you need more command line options, type “msiexec /?”. 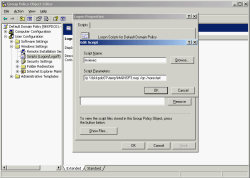 If you have to install on many computers, you can put the command in the Group Policy Object (GPO) in logon script and also move the service pack files (.msp) to share folder so that the file can be executed by others. 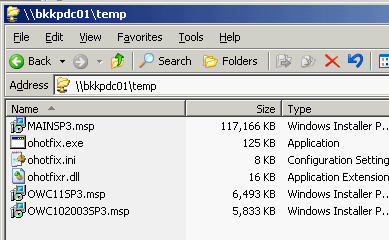 For example, I move MAINSP3.msp to \\BKKPDC01\temp which is share folder. to silent install Office SP3 silently with no restart after complete installation. 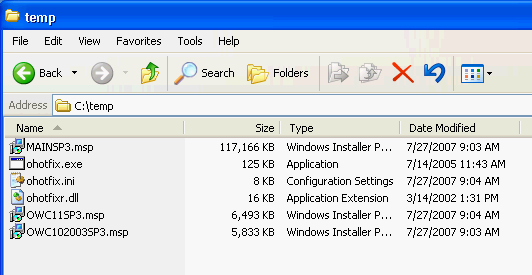 Now when user logon to Windows with user on domain, the script will be executed automatically. Note: This is only example If you need install this SP3 through GPO, you need to consider network performance issue. For instance, when many users are logon simulteneously, they also get the service pack file at the same time which can cause load on your network. You can solve this problem by not release this script to all users at the time. thanks for this guide. i just deployed sp3 and it was flawless. saved a lot of time. Does this script execute before or after a user signs in ? If after, does the user need to have Admin privilege ? It depends on where you have placed the script in between Computer or User configuration. 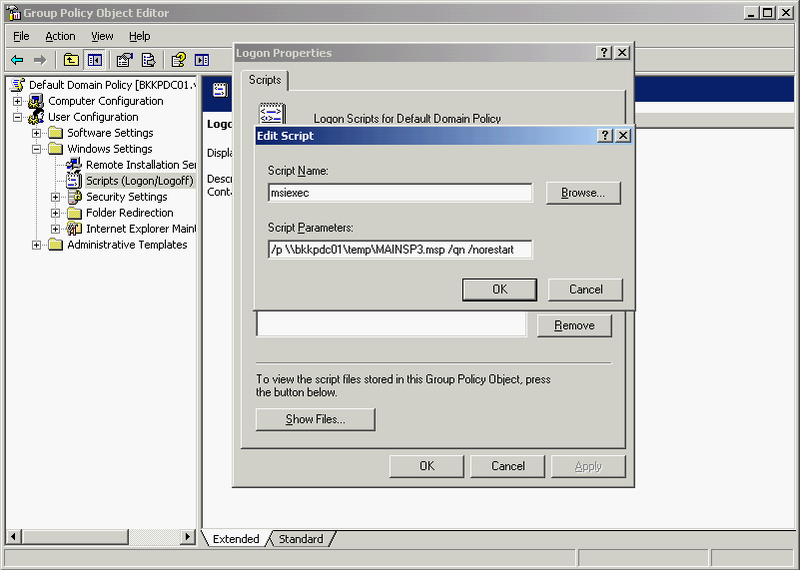 In the example, I place the script in LogOn/LogOff script so it is in User Configuration. If it is in User Configuration, the script will run when the user has logged on to the system. If it is in Computer Configuration, the script will run when the computer has startup, regardless of who logs on to the computers. For privilege issue, if it is a logon script, the script will run under current user logon privilege (user’s permission). If it is a startup script, the script will run under system privilege on the local computer. One more thing, there is a policy which can elevated privileges. It is located in both Computer and User Configuration -> Administrative Templates -> Windows Installer -> Always install with elevated privileges. I never try this policy so I can’t support on this issue. Does not work when put in the computer configuration as a startup batch script. I saw something like this in SE Michigan recently on machine in for repair. I don’t find any “msiexe” command, it said “msiexe” is not gecognized as an internal ore external command”, I am using windows server 2003 updated. So how can I get the command? It is “msiexec”. Windows Server 2003 should recognizes this command.